The Ros Tapestry is a unique project that has been on-going in the South East of Ireland since 1998 and has involved over 150 stitchers working on 15 giant tapestries for a permanent exhibition in New Ross. It is an excellent example of creativity and community spirit on a grand scale and depicts our Norman History, linking all the Norman sites in Ireland’s Ancient East. 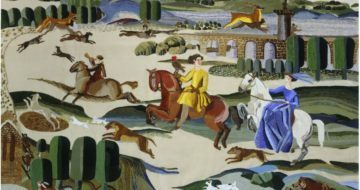 Ros Tapestry is one of the largest series of embroidered tapestries in Europe. 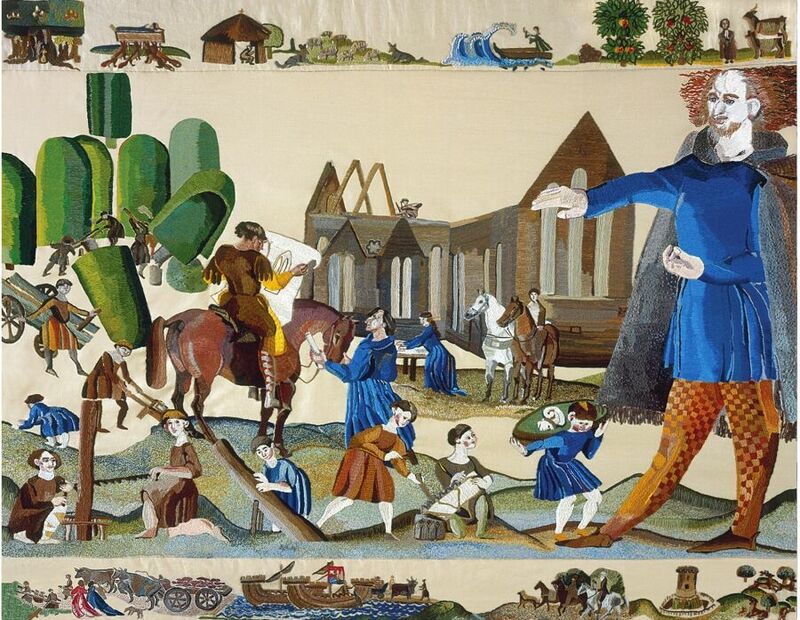 Each tapestry depicts a different significant event in the history of the town and surrounding areas. 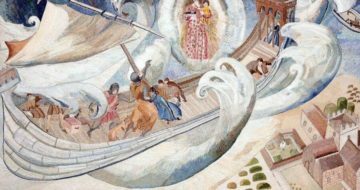 New Ross is central to at least four counties which were heavily influenced by the Normans – Wexford, Waterford, Kilkenny and Carlow, and their tales are richly told in thread here at Ros Tapestry. The exhibition is the brainchild of Rev. Paul Mooney, who was appointed to St. Mary’s Church in New Ross in 1998. 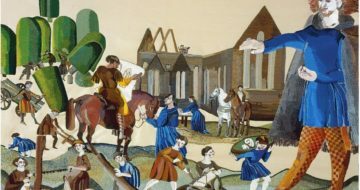 Inspired by the famous Bayeux Tapestry in France, he conceived the idea of creating a series of tapestries to display in his church, to commemorate the Norman history of the area. Rev. Mooney got in touch with the renowned artist Ann Griffin Bernstoff, and she set about painting 15 cartoons which each depicted a different significant event in the history of the town and surrounding areas. Word went out looking for volunteer stitchers and the response was overwhelming. Groups of stitchers set up around the country. They worked from private houses to community centres, converted cowsheds a castle and a fort. Acknowledged by all who see it as a true National Treasure this voluntary work is a true labour of love. A Tale Told in Thread: The stories depicted in these tapestries starts in Celtic Ireland looking at Celtic rituals, Woman Warriors and Brehon Law, to early Christian Ireland illustrating the collision of the pagan and Christian worlds, the Vikings of Wexford and the ousting of Diarmait MacMurchada from his Kingdom of Leinster and sailing to France in search of King Henry II. Which leads us to our main theme the Norman arrival in Ireland in May 1169? Discover and learn about the Greatest Knights that ever lived William Marshal who married Isabel de Clare heiress of Strongbow, Earl of Pembroke and granddaughter of Diarmait MacMurchada. Together William and Isabel transformed the wilderness on the banks of the deep river Barrow creating the town of New Ross, which became one of the most successful and wealthy ports in Ireland with over 400 ships berthed at any one time. Discover the castles, fortresses and lighthouse built by them, all beautifully painted in thread. The first tapestry was completed in 2002 and, to date, 14 of the 15 tapestries are complete. 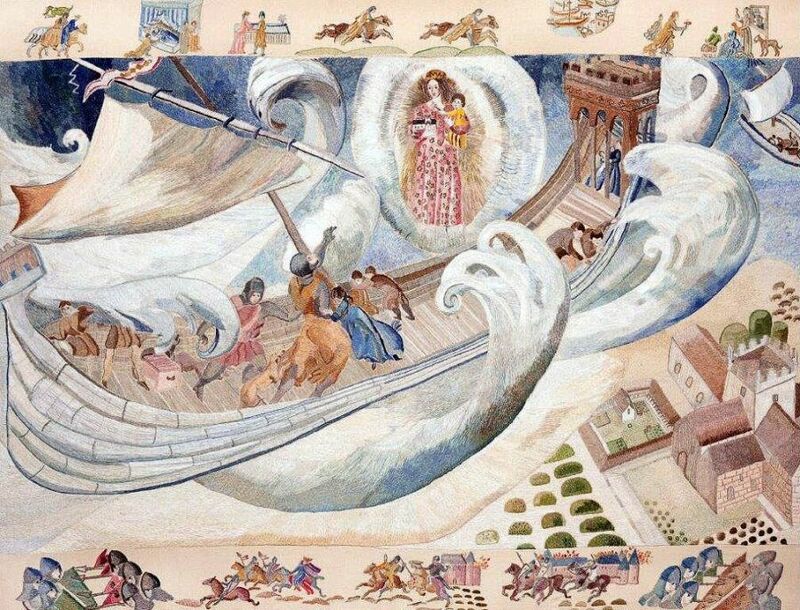 In 2008 the Ros Tapestry Exhibition was opened on the Quay in New Ross. The public now have the opportunity to see this amazing exhibition which is a fantastic craft legacy for the country. It is an excellent example of creativity and community spirit on a grand scale and depicts Norman History linking all the sites in Ireland’s Ancient East. 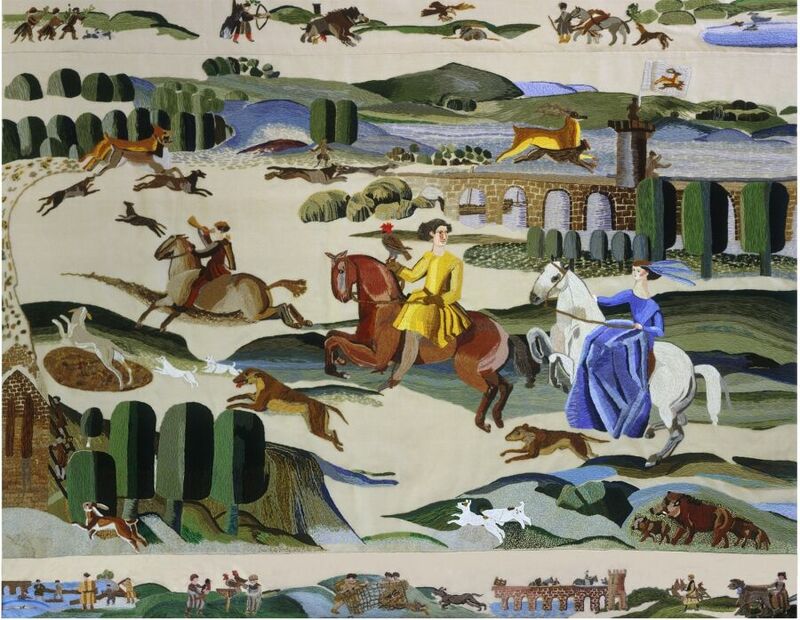 The Ros Tapestry is one of the largest series of embroidered tapestries in Europe. Each tapestry depicts a different significant event in history. Our project is a unique and exquisite work of art and deserves to get huge exposure, and be available for everyone to enjoy. The Ros Tapestry Exhibition Centre is just a 25 minute drive from Waterford City and is less than 45 minutes from Kilkenny City.